The first of its kind, this book is an in-depth history of hydrodynamics from its eighteenth-century foundations to its first major successes in twentieth-century hydraulics and aeronautics. It documents the foundational role of fluid mechanics in developing a new mathematical physics. 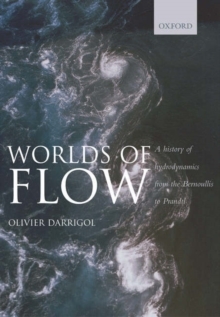 It gives full and clear accounts of the conceptual breakthroughs of physicists and engineers who tried to meet challenges in the practical worlds of hydraulics, navigation, bloodcirculation, meteorology, and aeronautics, and it shows how hydrodynamics at last began to fulfill its early promise to unify the different worlds of flow. Richly illustrated, technically thorough, and sensitive to cross-cultural effects, this history should attract a broad range of historians,scientists, engineers, and philosophers and be a standard reference for anyone interested in fluid mechanics.